I rolled out of bed this morning, and as my vision cleared from the “just woken up drowsies” I caught sight of something in the window. 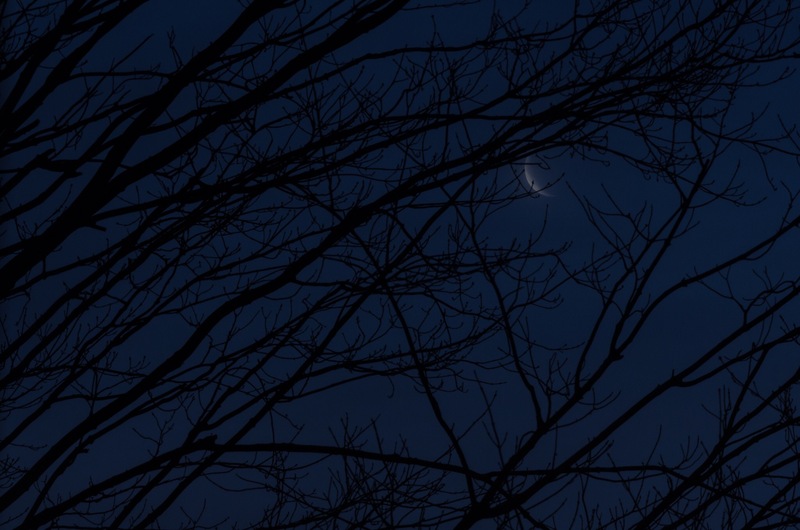 A sliver of a crescent moon, partially obscured by morning fog, was peeking through the newly budding branches of a tree. I stuck with my usual practice and headed downstairs to do my morning devotional reading 1. I also determined if the moon was still as distinctly visible following my morning reading I’d set up my camera to capture a photo or two. I knew I didn’t have much time to set up because the horizon was brightening with each breath I took. So I quick grabbed my tripod, set my camera settings, and switched the toggle to “timer 2.” I didn’t have time to move the chair which sits in front of our window, and didn’t even think to lower the upper window to clear my field of view, so the image below is significantly cropped in order to isolate my subject. In the end, I managed to capture two exposures. The second was much less distinct, and by the time I set up for a third the Moon had been completely obscured by a cloud bank. It’s not the best image I’ve ever taken of the Moon, but it possesses a wonderfully eerie quality. Thank you for that photo. I don’t remember seeing a moon with so little light.